What happens to old cooking trends after they die? Case in point: we own a full-size French fish poacher. It’s lurking in our basement like a giant carp resting on the bottom of a pond. How it ended up there is no mystery. It’s a beast, an unwieldy piece of steel, heavy as plate armor, a narrow oval the better part of a yard long, six inches deep and task-specific to the point of disdain. If we want to poach a swordfish the size of East Providence, we can winch the damn thing upstairs. It has no other uses. Unless you count its possible utility a planter. Still, we hang on to it. Our children will inherit it. During the first flush of the culinary revolution led by Julia Child, James Beard and their contemporaries quite a few devices escaped their imprisonment in restaurant kitchens and found refuge with sympathetic home cooks (why do you think people today chop shallots with surgical steel instead of the steak knives you used to get at gas stations?). If some of those early escapees couldn’t adapt to civilian life (fish poacher), so what? We tested our limits, and we’re better for it. We make pho now. Who wants to go back to the days when Swiss fondue was exotic, if not daring, and fashionable parties were built around omelettes, for God’s sake? (Rent the 1970 movie Diary of a Mad Housewife if you don’t believe me.) If nothing else, we’ve become more educated cooks and diners. Once in awhile a technique drops off the radar for no more reason than the fact that everyone everywhere seems to be doing it, and becoming aware they’re doing it. That’s my theory about cooking seafood en papillote – baking it in parchment – a perfectly respectable technique that became a menu cliché, probably because it’s so easy and effective. Some people believe the trimmed parchment sheet used to fold a papillote resembles a young lycée student’s outline of a papillon, a butterfly. I think it resembles a young lycée student’s outline of a heart, but I must be in the minority. In any event papillon becomes papillote, a butterfly-shaped package. 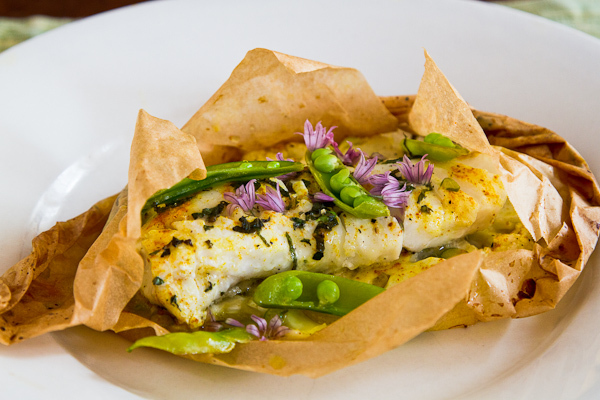 Cooking in parchment is both simple and easy, the antithesis of using a fish poacher. You place a piece of seasoned seafood on your butterfly cut-out, throw in some cut vegetables, fresh herbs, and a bit of fat in the form of butter, olive oil or coconut milk. Fold the butterfly in half, crimping the edges of the wings together, and then bake it. Ten or fifteen minutes later everyone gets their own very cool package to open. Lots of oohs and aahs and no roasting pans to clean. You can even use parchment made from recycled paper like we did, or foil, although with foil you don’t get that wonderful crackly effect that you do with baked paper. Edible origami. Jody and I don’t consign anything to the dustbin of culinary history. We just send it to the basement. Everything was new once and you never know when an out-of-fashion technique or piece of superannuated kitchen equipment will put in a return appearance, revivified in its absence. 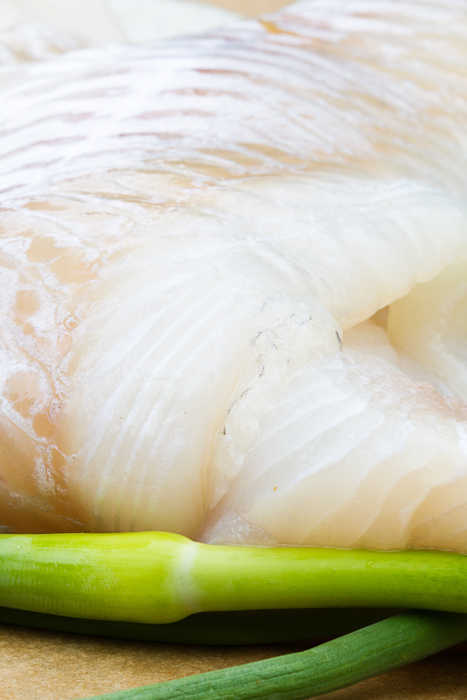 Plus, you need a whole-poached-fish period in your life to bulk up your culinary muscles. And if ten-pound halibut become the thing to serve your friends this winter, you’ll know where to find me – in the basement. Cut 4 sheets of parchment into hearts. The width of each heart is about the width of the roll of parchment. Look at the photograph to get an idea of their size and orientation. Crease them down the center like Valentines, then open them back up. Brush the exposed surface of each heart with 1 teaspoon butter, leaving a 1-inch border untouched all the way around. 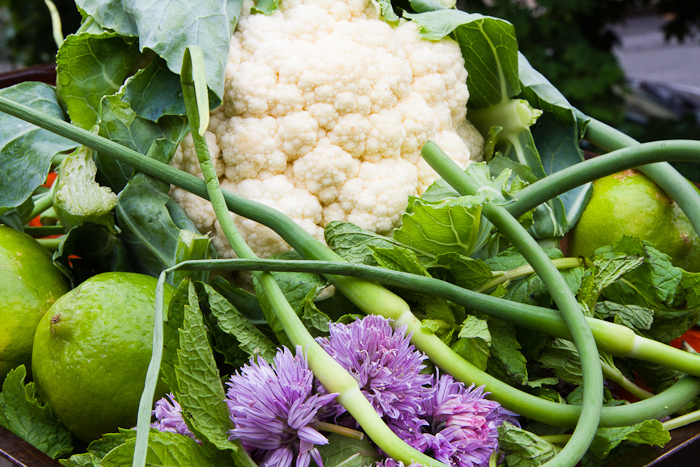 Using a mandoline or a very sharp knife, cut the cauliflower into slices ⅛-inch thick. Put the cauliflower into a bowl with the scapes or scallions, season with salt, pepper, a tablespoon of lime juice, and 1 teaspoon mint. Toss well. Arrange the cauliflower over one side of each heart in a single layer, leaving the 1-inch border free. Again, see the photo. Don’t rinse the bowl. Put the cod into the cauliflower bowl, season all over with salt, pepper, curry powder and the remaining lime juice. Toss gently to coat each piece with the seasonings. Set a piece of cod atop the cauliflower. Sprinkle with mint, dot with the remaining butter (or sprinkle with coconut milk). Put 4 sugar snap pea pods on top of each piece of fish. Fold the empty half of the heart over the cod and vegetables, securing the edges with a series of overlapping folds. Start at the rounded end, working your way down to the point, twisting it into a tail. Tuck the tail under the bundle. We’ve left it up in the photograph so you can see it. Transfer the packages to a sheet pan. Bake 10 minutes, or until the fish is done. Let rest 4 minutes. To serve, cut a cross in the top of each package. Peel back the paper and garnish with mint sprigs or chive blossoms. The last time I wrote a recipe for fish baked in parchment was 1997 so when Ken brought up the idea of fish en papillotte it was a total blast from the past. 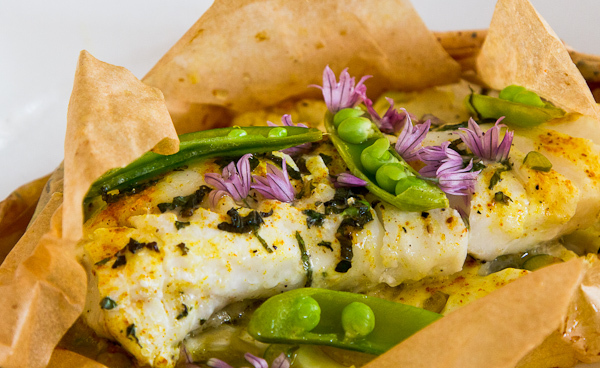 Fish in parchment can be prepared ahead and refrigerated, takes just 10 minutes to bake, and is tasty and healthy. . . leaving room for cheese or chocolate after dinner. Nothing with the same wow factor is anything near as easy to make. After testing the recipe using only butter, we had some extra ingredients and since Ken had lobbied for coconut milk, I humored him by trying it. It was good, but missing something. Roxanne figured it out: “Don’t they put sugar in some Thai food?” We added a sprinkle of sugar, then tasted it again. She was right. This particular recipe should get you started cooking in parchment. The formula’s pretty simple: firm fish; vegetables; butter, coconut milk, or olive oil; fresh herbs; some sliced lemon if you like. Remember to cut the vegetables thinly or they won’t by done by the time the fish finishes. Let the bundles rest for 4-5 minutes before serving. The beast. I wish I had it. Although….. Yes. I’m off to the fish and farmers’ markets! Excellent directions and photographs make it seem possible. This recipe looks fantastic! Adrian and Joanna will be blown away… and then they’ll be adding parchment paper and coconut milk to their weekly shopping list! Who would have guessed???? We have our own pasta cutter in the basement, thanks. yum, makes me want to re-start my fish csa! This blog is really wonderful. The recipes are all very elegant but not intimidating! Love the photos. Gee, we meant to be intimidating and really snotty. ;-) Glad it’s working for you. Thanks for the good words. We store the family chocolate in our fish poacher. Photos by Ken? Guilty as charged. You made it all sound so easy (pictures SOOOOO helpful! ), I think I could actually make this, thank you! What does it mean if one’s cooking gadgets are relegated to a small attic room, rather than the basement? Is there some hierarchy of afterlife for such items? You CAN make it! Believe me, this one is bullet-proof. Food and butterflies–two of my favorite things on the planet. What a great recipe! What a spectacular recipe … thank you for sharing! Hmmm, whatever happened to our tortilla press. We won’t even buy a waffle maker for the basement destiny reason you cited. Great post. Funny and a great recipe to boot. Congrats on being Freshly Pressed. I don’t even like fish, but this looks delicious! This looks sooo good! I’m inspired. your post reminded me of steaming fish in bamboo, and what a mess that is. Not exactly fish poacher territory, but a hassle never the less. Thank you for reminding me about Diary of a Mad Housewife & that wonderful omelet scene. Richard Benjamin has got to be the prize winning jerk for his brilliant portrayal of the all too familiar husband. Great post! He was spectacularly dreadful. Who stole my Inuit carving? Looks delicious, maybe someday I will make it or Thai trying. Wonderful post! Your pictures are mouthwatering! Fab pics… making me drool here…lol. 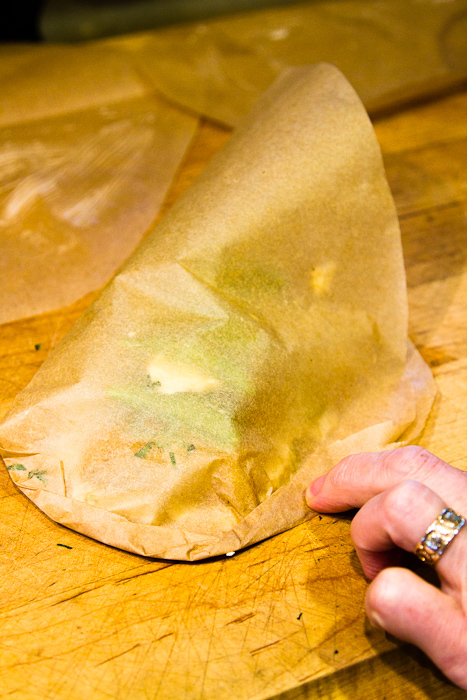 What is the difference between using parchment paper or cooking something in a “baking bag”? Have never used parchment before… intriguing…. Not sure, except that the baking bags I know about open at one end, which is fine for chicken with dry ingredients. Not so good for liquid ones, but if you can get everything inside give it a shot. great post! looks delicious and love the parchment in the shape of a heart! Now you have me wondering where the heck our fish poacher has gone (Not really). I love the idea of coconut milk as the fat for the parchment baked fish. Lovely photos also. What type of camera are you using? My pics always look bad. Canon 7D, but as I had to read a thousand times before it sunk it–it’s not the camera, it’s the photographer. Good photographers take great pics with modest cameras, and novice photographers take bad photos with expensive gear. A photography class or workshop in food photography where you can get feedback can be a big help (at least it was for me). How brilliant. I know what you mean about the poacher. Mind you the same can be said for slow cookers and rice cookers and egg poachers. Maybe they would make great planters for succulents. In aany event I love cooking in baking paper (which is what I assume parchment is). Great poast aand fabulous photoss. Baking paper = parchment paper. Thanks for the comments. Ahh!! It looks SO good!! I’m not a huge fish fan…but that looks so scrummy! Oh what I wouldn’t give to have a basement full of useless kitchen items. I seet clear of any shops that sell kitchen items for fear of filling my kitchen to avalanche capacity. Probably a wise policy. Careful what you say about slow-cookers–God invented them so you can make confit at home. This recipe sounds absolutely delicious. Can’t wait to try it. I’m not a fan of fish, but wow. This recipe makes me really want to try it! I bet the parchment gives the fish a really unique flavor. Actually, it’s not the parchment–it’s the stuff the parchment traps inside with the fish. Give it a shot. The pics are beautiful!!!!! I bet it’s delicious! I think we’ll try this…..
Actually this is something you CAN do with kids. Just set up everybody with a heart and let them butter the paper. Add the fish, then let them add the veggies. You drizzle the liquid and then get everybody folding. Have fun. Oh I love the taste of cod! Thanks for the recipes and for the lovely photos. Beautiful article, recipe and photos, thank you! 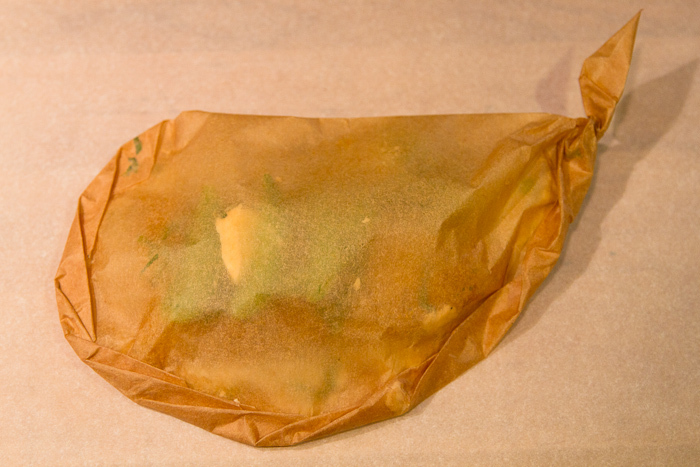 Pingback: FOOD: Recipe- Curried Cod Baked in Parchment Paper | A Girl Named Bong…. Hey, thanks for the blog love! hmm… looks so yummy. Gotta try it. This looks like a great recipe! You make it look so easy – I plan on trying it later this week. Fingers crossed mine comes out looking half as good! Go for it! It will be great. Thanks, I’m going to make it tonight,…I’m starving already. We love craft and artisan beers. Just don’t drink too more than one Chimay Cinq Cents before you start to fold. Doh! My late afternoon hunger set in just before I landed here. Now I’m starved, and drooling all over my shirt. As a grandmother, I got a real chuckle out of your fish poacher in the basement. Will your kids even know what it is when they inherit it? They’ll think it’s a coffin for a small robot. Read this and now im staving thanks, for somthing that sounds so good. It looks delicious. Unbelievable pictures!! Brilliant idea! 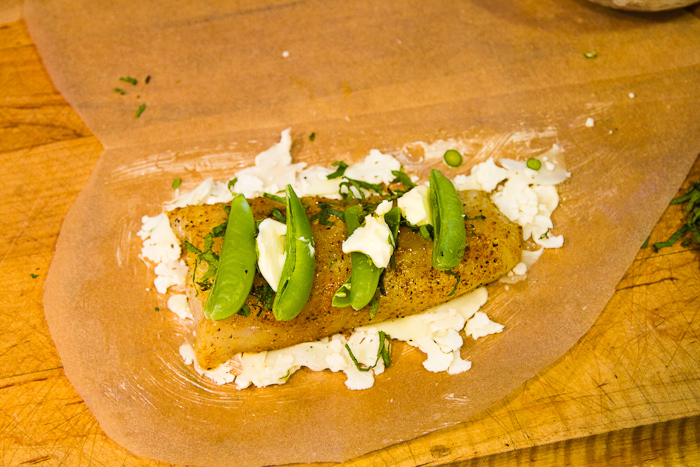 How come I never thought of using parchment paper to cook my fish? I have always used foil. If one can cook squab in parchment, why not fish? thanks so much! Living in Florida we have no basements….now this makes me wonder about all the gadgets I could still be having in my possession if I only had a basement…. This is very beautiful and creative~ Am sure this is full of goodness! Yum! I must say I hate seafood, but this presentation is amazing! I could use chicken instead :-) Congrats! Maybe you could try it ONCE with seafood. Please. THEN you could do it with chicken. I haven’t cooked fish like this in a while. I might do this for the future in-laws on Friday. 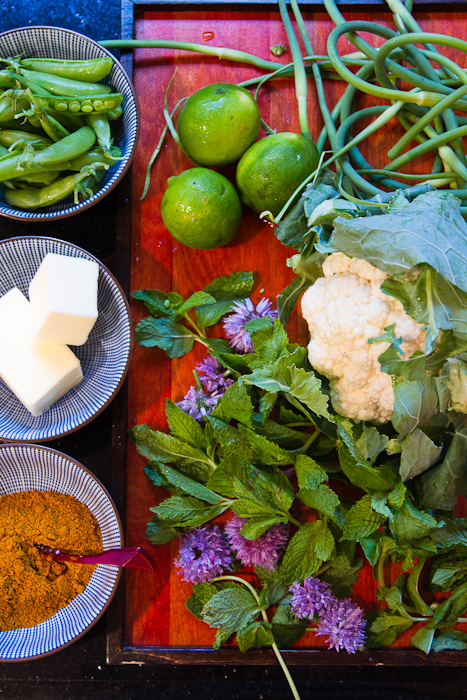 Oh man this looks and sounds delicious — curry is a power food! I love your revival of the snowed-under host’s favourite/easiest cooking method – en papillote. I have never done it ‘properly’ as a butterfly but it works nicely as a folded rectangle or circle, and always with fish to keep it a true ‘fast food’ option. The idea of opening a present of food is universally appealing, as is the whoosh of fragrance when it is greedily opened. Quite the best way to serve fish in my humble opinion. Lovely images and instructions. Wow, the fish is beautiful and it is must delicious!! I’ll try it this weekend. Thanks for your sharing! presentation, presentation. It look absolutely lovely and delicious, but i know if i try it maybe not lol. Love to cook (and eat! ), but really have no clue on presentation. The arrangement of food for presentation enhances the satisfaction of the meal, for sure. How about a blog on presentation? You do such a good job i want to eat the picture!! Wow, lovely blog. I really enjoy your writing style. Lucky for me I’m still a foodie virgin and seeing all this techniques is new for me! love it. Something to impress the family with. Love, love, LOVED the article and the photos, so much that I pressed it. You guys are inspiration. Thank you. new baby, new family, now needing an oven, and first thing to try would be this. thanks! I saw this on FP yesterday and meant to comment but I didn’t get to it today.. I’m so happy to see someone else posting about this! This is very close to one of my favorite recipes and something I make at least once a month.. love it!! I tried your recipe just a little while ago and it came out fantastic!!! Looks DELICIOUS! Glad I stumbled across this. So delicious…………..I really like your blog…………. The pictures look amazing and delicious !!! Hey Ken and Jody. Thanks so much for taking us on this adventure with you. Pickled cherries are in the refrigerator, the cod en papillote is resting for the four minutes as I write and I am going to make the shrimp oil mayonnaise and shrimp as an appetizer to bring to a friends tomorrow night. The first time i made that everyone went crazy. In a good way. Thanks again. Ken and Jody. Thanks so much for taking us on this adventure with you. Mmmm. I just finished cod en papillote though with lemon and sliced tomatoes instead of lime and peas. Can’t wait to make it with lime and coconut milk next. Like, Monday. Pickled cherries are in the refrigerator. I will again make shrimp oil mayonnaise and shrimp as an appetizer for a friends dinner tomorrow night. The first time everyone went crazy. In a good way. Thanks again. so did you try this and what did you make. I love the surprise when you open the package. What a great site. I will try your thoughts on Striped Bass Poached in Olive Oil! Looks delicious! I forget about the wonderful things you can do with parchment paper. yeah… there are so many things. i love shrimp on pasta with hot peppers and tomatoes.